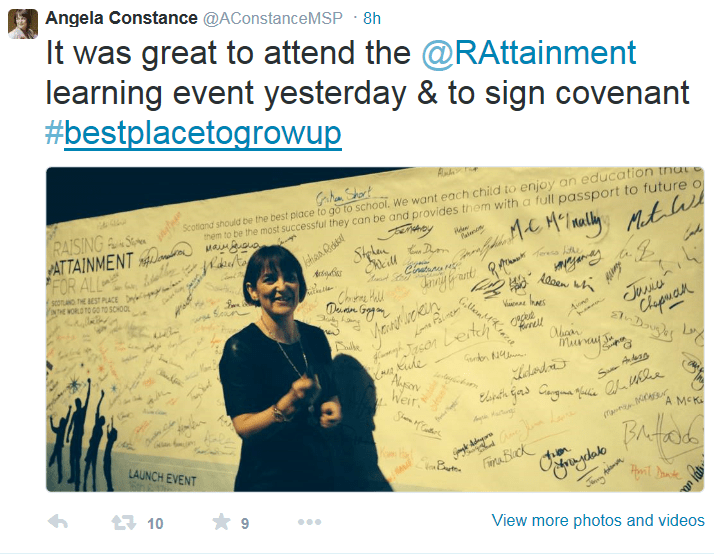 Raising Attainment for All or just for 85%? Over the last couple of days I’ve been following tweets from the Raising Attainment for All National Learning Session 2 in Glasgow with great interest. Even from the tweets it’s clear that there is a real buzz and feeling of purpose surrounding this event. Schools and colleagues from across Scotland are sharing super stories of improvement and how they’ve been making progress and tracking it. Stretch Aim 1 To ensure that 85% of children with each school cluster have successfully experienced and achieved CfE second level Literacy, Numeracy, and Health and Wellbeing outcomes in preparation for Secondary School by 2016. Stretch Aim 2 To ensure that 85% of children within each school cluster have successfully experienced and achieved CFE Third Level Literacy, Numeracy and Health and Wellbeing outcomes in preparation for the senior phase by 2019. Stretch Aim 3 To ensure that 95% of young people within each school cluster go on to positive participation destinations on leaving school by 2018. Stretch Aim 4 To provide the leadership for improvement both nationally and locally, across the Raising Attainment for All Programme. 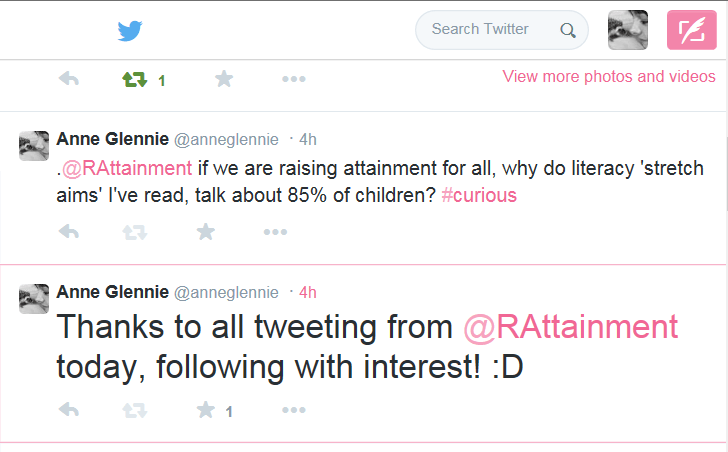 If we are truly Raising Attainment for All – then why do the ‘stretch aims’ consider only 85% of the children? What about the missing 15%? Will they go to secondary school without having achieved or experienced Second Level in Literacy? Is the stretch aim stretchy enough? Are we happy to accept that a significant percentage of our children will leave primary school with levels of literacy that will severely impede their progress and prevent them from accessing learning and literature? 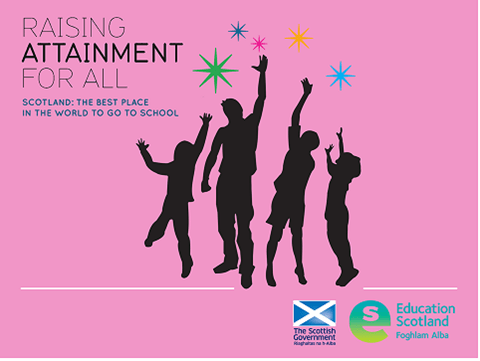 If our true intention is to close the attainment gap and ensure that Scotland is the #bestplacetogrowup and that education here is transformative for all, then surely we should also be focusing on the 15% – because that is precisely where the gap likes to live? Hi Anne Perhaps not all, but some, of the 15% will be children with additional needs for whom CfE second level would be neither achievable nor appropriate. The 85% target is by 2016. If that is achieved by 2016 then a new 'stretch aim' could be created. As a school taking part in this project I can confirm that it really is making a difference. Our focus is reading. It would be great if you could be part of a RAfA project or a speaker at a learning session.